What is The Tree Next Door? The Tree Next Door (TTND) is an organization of individuals and neighborhood groups that seek to protect Atlanta’s lush tree canopy. Our roots go back to the spring of 2009, when many Atlanta residents began to realize that the Atlanta City Arborist Division wasn't fully enforcing the Tree Protection Ordinance, which is supposed to result in no net loss of trees for the City. 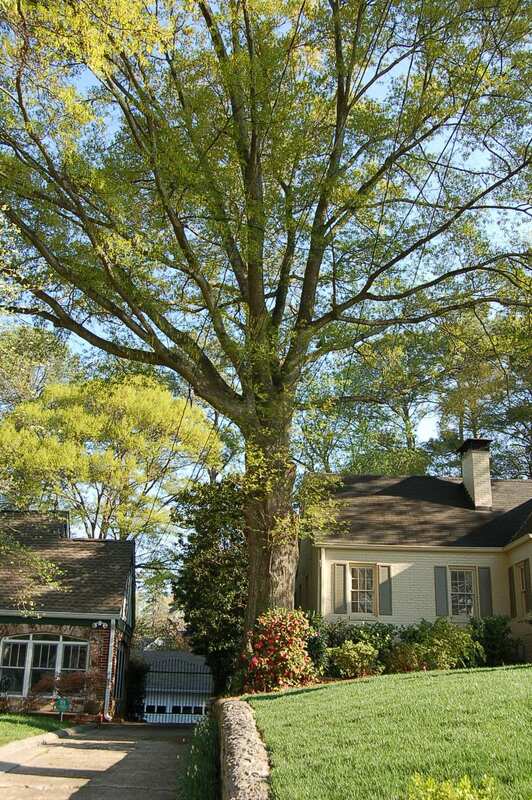 Although Atlanta's tree ordinance has some notable shortcomings, it is still among one of the strongest tree ordinances in the country. Yet, it isn’t worth anything if it goes unenforced. To this end, TTND's mission is to advocate for enforcement of the City's tree ordinance and to educate the community about the importance of maintaining a healthy urban tree canopy. We strive to ensure that Atlanta’s Tree Protection Ordinance and arboricultural standards be enforced as written. We provide assistance, identify resources, and act as a liaison between citizens, developers, and the City. At the same time, we identify weaknessses in the ordinance and its enforcement procedures and advocate and organize to eliminate them. We work with other organizations and individuals to educate Atlanta’s community about their rights and responsibilities under the law and about the importance and value of maintaining a healthy urban tree canopy. Why Are You Called "The Tree Next Door"? We call ourselves “The Tree Next Door” because most people get concerned about trees when it’s the tree next door to them that’s being impacted, not a tree on the other side of town. Although there are tree planting groups in Atlanta, the most recognized being Trees Atlanta, tree planting alone cannot compensate for the loss of the mature hardwoods and pines that define Atlanta as a "City in the Forest". Replacing cut trees will not restore an urban forest in the lifetime of most adults. Therefore, in addition to tree planting groups, we felt that it was time to have a group that was focused on conserving the trees we already have to the greatest extent possible. Don't Tree Regulations Hurt Development? Tree cutting regulations should strive to balance the interest of developers with the interest of the community at large. The Tree Next Door recognizes that development is necessary for the economic health of Atlanta. We are not anti-development; rather, we are pro-responsible development. We do not think it serves Atlanta's long-term interest to have a treeless landscape among its rampant sprawl, traffic congestion, smog. Instead, we support developments that make Atlanta a better place to work, play, live -- and breathe! In some cases, it is even necessary to remove healthy trees to make modifications needed for an even more environmentally friendly in the future. An example of such projects include the streetscaping project on Peachtree Road several years ago, particularly in front of Lenox and Phillips Mall, and at the intersection of North Highland and Virgina Avenue in Virginia-Highland. Although both of these projects necessiated the removal of large mature trees -- which generated many complaints to The Tree Next Door -- these trees were replaced with many more trees of a species that will thrive better in an urban environment. Also, traffic flow along Peachtree Road was dramatically improved from what it was before the streetscaping project, reducing the amount of vehicle exhaust being released in the atmosphere. In other words, development is not all bad. But when it is, we will be there to speak for the trees!